When it comes to urban democracy it is dangerous to stare blind on the machinations of power and the creation of consent through consensus politics. It makes that discussions on democracy tend to drift away to the misty margins of society, where business negotiations in stylish board rooms are backed by brute police power. More important is the question how to re-imagine democracy in the neoliberal city. Let me tell you the history of Pic Nic the Streets. It was a civil movement shaking the very heart of Brussels with a series of picnic’s. The idea was to give a final push to the long awaited makeover of the Beurs Square and Brouckère Square – two squares that were at that time cut by the main artery running from North to South leading an endless traffic stream right through the City. Architectural plans were on the table for years but got never realised for unclear reasons. The Pic Nic The Streets movement offers a few lines of flight for imagining urban democracy. This article is a retroactive manifesto for Pic Nic the Streets as a contribution to the architecture culture in Belgium, written on the basis of talks with Joost Vandenbroele from city movement BRAL and other engaged people. On May 24, 2012 philosopher Philippe Van Parijs published an open letter in the three local newspapers addressing the three main language communities in Brussels – French, Dutch and English. The open letter was a classic article in which the author makes use of the upcoming elections to voice discontent about a certain issue – in this case: traffic congestion on the central boulevards of Brussels. The letter was not just a lament, but brought a clear proposal to end the political lethargy around the issue. Van Parijs suggested the organization of a massive picnic at the inexistent Square de la Bourse, actually calling for an act of civil disobedience blocking the Anspach Boulevard. The suggestion could not be misunderstood as the author addressed the call explicitly to the Twitter- and Facebook generation. The letter reached its destination. Only two days later a group of thirty enthusiasts pulled together putting up a Facebook event – even with a wrong title, noting PNTS in singular instead of plural. A date was pinned for the picnic: June 10, 2012. The rest of the story became history. In no time thousands of people confirmed their presence through Facebook, causing viral media attention. Former Mayor Freddy Thielemans (PS) was awkwardly helpful in building up momentum. First he denounced an eventual picnic at the Beursplein as an illegal occupation and cynically bragged there were far better places to go out for picnic on a Sunday afternoon. The sniffy rejection by the Former Mayor caused went viral on online platforms. Second the Former Mayor opportunistically endorsed the picnic by saying with dry eyes that it matches very well the ambition of the City of Brussels to rearrange the Central Boulevards. The sudden change in position opened the floodgates. The goal was reached only five picnic’s and a change of Mayor later: the Central Boulevard turned into the so-called biggest inner city pedestrian of Europe. The car free Boulevard is organised in a test phase – and became part of a horse trade with a new mini-ring for cars plus extra underground garages – but it is nonetheless a big success. Especially in Summer the Central Boulevards set the stage for what looks like a permanent demonstration. Pic Nic the Streets caused a trend reversal in the relation between power and activism. A few elements are crucial to its success. The first new strategic element of Pic Nic the Streets is without doubt the use of a Sunday picnic as tool for action. The picnic was planned as a festive gathering of joyful yuppies, trendy urbanites and young families with playing children. In French they are altogether called the eco-bobo’s – ecological bourgeois bohemians. In fact most manifestations are festive excursions on a Sunday afternoon, but in the case of the picnic all stereotypical protest attributes were banned, such as banners, placards and slogans. The picnic was staged as an apolitical happening on a lazy Sunday afternoon. The peculiar scenography gave the action the character of a prefiguration: the picnic set an image of the desired use of public space in the big city. Pic Nic the Streets embodied the urban quality of living that was the object of desire: a public space that is not only functional to the flow of automobile traffic but also provides breathing space for young people and children. It makes that the manifestations did not so much demand anything, but rather stirred up the desire for another city center. A second new strategic element is the discourse, carefully constructed around a logic well known in contemporary communication and PR. Using minimal means, Pic Nic the Streets set up a massive media offensive around one clear cut message of ‘five lines of positive thinking’ that called upon one symbolical but concrete action: the occupation of the Beursplein with picnicking youngsters and families. The images came by itself and were going around virally. The discourse was wide and diverse, leaving opening for individual outings, but the bottomline stayed the same. It shows how Pic Nic the Streets replaced the usual arsenal of political activism in Brussels with a technology that is inherent to virtual mass media. They did away explicitly with the usual tools such as manifestos, declarations, popular assemblies (états-generaux), petitions and press conferences. In the place came the force of mere repetition (the same five lines were reproduced time and time again), the force of the number (Facebook made the interest immediately visible) and the force of freedom to interpret (there is no thing as bad press). Both elements are important features that allow us to re-imagine democratic action in Brussels. Given the power monopoly of the Parti Socialiste for decades, antagonism has been the model of protest for decades in Brussels. Critical agents can only act oppositional and demand the impossible. Reaching out to power makes a critical agent immediately suspect of corruption and impurity. As such criticism is caught in a hysterical discourse: it directs itself one-dimensionally towards the existing power and engages in a heroic fight with them, but also leaves the initiative to its Other. Pic Nic the Streets presented itself on the contrary as a counter power willing to dialogue with all share- and stakeholders. Part of the strategy to spread the positive message, was to stay friendly for the people in charge, disregarding political color. The activists transcended the theatre of representative democracy by simply presenting themselves. It was a democracy as presentation, saying: we are here. The conviction was that in the end all political parties are propagating quasi the same program, and sooner or later turn their course according to the wind of change. Politicians need a push in the back now and then to set in motion the governmental administrations. Indignation was the motor for sure, friendly, and joyful determination was the strategy. The loose movement was struck by confusion after its sudden success. The negative atmosphere of the retailers in the city centre backlashed on the among activists. The platform ‘Oui mais Non’ criticized the half-hearted result, the theatricalisation of the public space, the gentrification of the city centre, the political recuperation for the construction of a new mini-ring (again with two lanes running in the same direction) and underground parking garages, and so on. Analysts (Tine Hens) cited immense but short-term visibility as a success factor for Pic Nic the Streets, arguing the disappearance of the movement as part of the natural course of events. But there is more to say. It is striking that the people in the movement itself uses two very different indicators for taking the measure of success and/or failure – in both cases the disappearance is not a loss, but part of the dissemination. 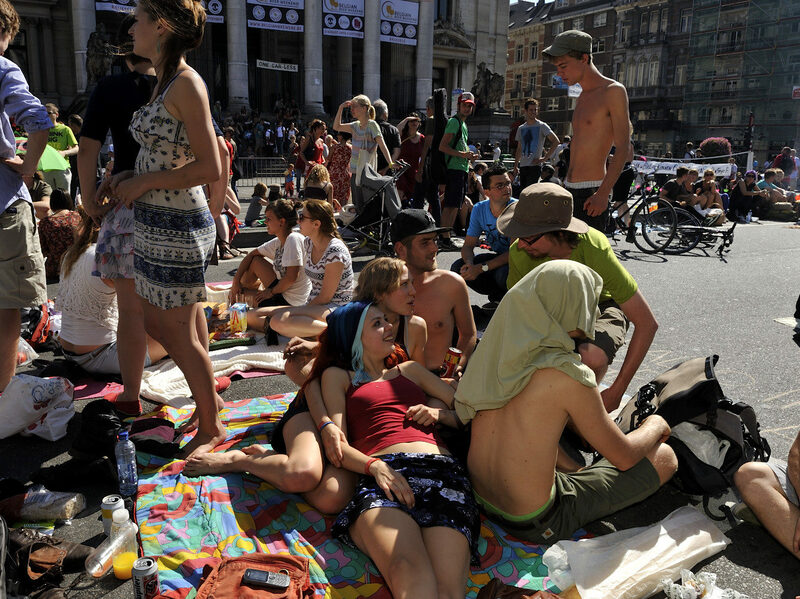 In the first place there was a miraculous multiplication of picnics: Pic Nic the Streets was organized at many other hot spots in Brussels – picnics were held at Saint-Gilles, at the Ninoofse Poort traffic roundabout, at a famous Turkish shopping street in Schaarbeek, etc. The movement fragmented, but the means of action was passed, starting a life on its own. The techniques with which Pic Nic the Streets had experimented spontaneously became a normal and indispensable instrument for urban activism in Brussels. In the second place, the City Council took over the discourse of Pic Nic the Streets. The traffic-free zone will undoubtedly be subject of political manipulation in the future. The zone may be shortened and/or partially occupied as parking plot for cars. However, the idea that the central avenues of a big city can turn into a walking promenade became irrevocably part of the collective imagination. It is easy to compromise the promenade, but the idea can never be outrooted, reflected an engaged person years later. We arrive at a very different view of the product of activism. The architecture of the public space is often reduced to the design of a crown jewel, such as the monumental canopy designed by XDGA on the nearby Place Rogier. The decennia old plans to redo the Beurs and Brouckère Square shows first a critical awareness is needed for architecture to happen. In the eyes of Pic Nic the Streets’ core group, freeing up traffic from the Anspach Boulevard is not an end in itself, but a step in the development of a totally different architecture culture necessary to support a future redesign of the city centre.